Wow…this season seems to be an award season for me and I give God praise for all of them. 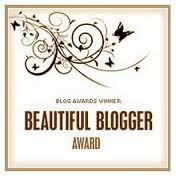 I just want to thank Poetic Journey for this Beautiful Blogger Award. She is a phenomenal woman battling sickle cell anemia and her blog has been very inspirational and humbling in that through her struggles, She still sees God as Greater in her life. We don’t have to be sick to appreciate God, we just have to understand that He is our Maker, He is the one that created all of us uniquely and that’s what makes Him great in the first place. So our circumstances don’t change the Fact the God deserves all the Glory, all the praise today and everyday. God is AWESOME !!!!!! I do encourage people to visit her blog, because her journey has been full of ups and downs and in spite of it all, She still gives God all the Glory. Thank you my dear friend for this nomination. You are a blessing to me in this blogging world. God bless you hun. I Nominate the following bloggers for this Award. Sherline, Congratulations once again. You are truly deserving of this award. Keep posting whenever you are free, okay? Regards.!!! You’re welcome hun, I know you already have it but I want more people to know how much of a blessing you are to me 😀 Stay Blessed hun. Congratulation! You are so deserving of this award…you are beautiful… Inside and out. Aww, thank you so much Tanya. That means a lot to me. Wow, Sherline–congratulations on a much deserved reward from a MOST esteemed blogger that I love and admire so very much, journey! And I am most humbly honored that you nominate my blog here. Also, I congratulate you for nominating dear Celeste: such a very talented poet!